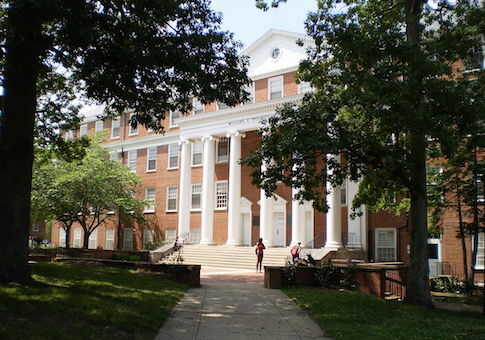 A former professor at the University of Maryland has filed a federal charge of discrimination against the College of Education, alleging that her termination from the institution was retaliation by her superiors for her extramural pro-Israel advocacy. Melissa Landa initiated the investigation Tuesday with the U.S. Equal Employment Opportunity Commission, cross-filing with the Maryland Commission on Human Relations, after an internal Title IX investigation completed in November found no evidence that university officials discriminated against Landa on the basis of political affiliation, religion, or national origin. In her filing, Landa cited a string of incidents running through 2016 and 2017, leading to her termination last summer. She alleged that she was discriminated against based on her religion, political affiliation, and gender identity. She claimed repeated confrontations erupted across a two-year period with the chair and associate chair department of Teaching and Learning, Policy and Leadership, Francine Hultgren and John O'Flahavan, over Landa's pro-Israel, anti-boycott activities and her taking time off to observe religious holidays. A grievance board this summer found no wrongdoing by the university, Hultgren, or O'Flahavan, but recommended that Landa be reinstated to her former teaching status. Three days later, Hultgren told Landa her contract would not be renewed. A Title IX investigation was then launched, and found in the fall Landa was not discriminated against. Landa's lawyer, Ari Wilkenfeld, disregarded the internal investigatory process as unreliable. "Seeing a university hold itself accountable for something they've done is like seeing a unicorn," said Wilkenfeld, a founding partner at the Washington-based firm Wilkenfeld, Herendeen & Atkinson. "Every university is different in how much distance it places between themselves and the Title IX office, but at the end of day, they are still university employees. If I were a Title IX investigator, I'd think there were only a certain number of times I could find against the university, before I'd need to find a new job," he added. Wilkenfeld said the Title IX process did not consider all the evidence Landa provided, and the investigator did not contact six of the eight witnesses Landa had listed as capable of corroborating specific allegations of discrimination. Wilkenfeld, who is also representing the anonymous female NBC employee who filed the sexual misconduct complaint against Matt Lauer that led to his termination, added he believes there is a distinct sexist element to Landa's case, as well. The Title IX investigation quotes UM officials as referring to Landa's "fragile emotional state," and depicting her time off to observe Passover as a mental health vacation. Landa seeks reinstatement or compensation, according to her EEOC filing. "I will not quit fighting," she said. "I’ve been dealing with discrimination and animosity for years. There's a culture of discrimination going on behind closed doors at the College of Education that needs to be exposed." Wilkenfeld said Landa's case of alleged direct professional retaliation for engagement in Israel advocacy is the first of its kind that he's seen. The university told the Washington Free Beacon in a statement that it had not yet been officially notified of Landa's actions and could not comment. "We are confident that the university's policies, followed in good faith, ensured a fair and exhaustive review of Dr. Landa's allegations of discrimination," the statement continued. "Her claims were thoroughly investigated and reviewed. We stand by the findings on this matter. The university does not tolerate discrimination in the workplace." The College of Education has recently come under scrutiny for an undergraduate curriculum that students say has become unfocused, repetitive, and incomplete, as administrators have pursued a diversity-focused overhaul to the coursework.